For organizations based outside of the United States, the DiSC Classic Profile is available in over 25 languages including French, Chinese, German and Japanese through Wiley International Partners. 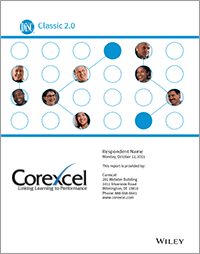 For U.S. based companies with employees who speak English as a second language, please call Corexcel at 1-888-658-6641 or send an email through our contact form for details on the DiSC Classic Profile French Edition. While the assessment questions are presented to the user in French, the resulting report can be generated in either English or French.